China will release Q4 GDP at the beginning of the week, foreseen up 6.4% YoY. AUD/USD in broad consolidation, neutrality won't last. The AUD/USD pair aims to close the week as it opened it, around the 0.7200 figure. 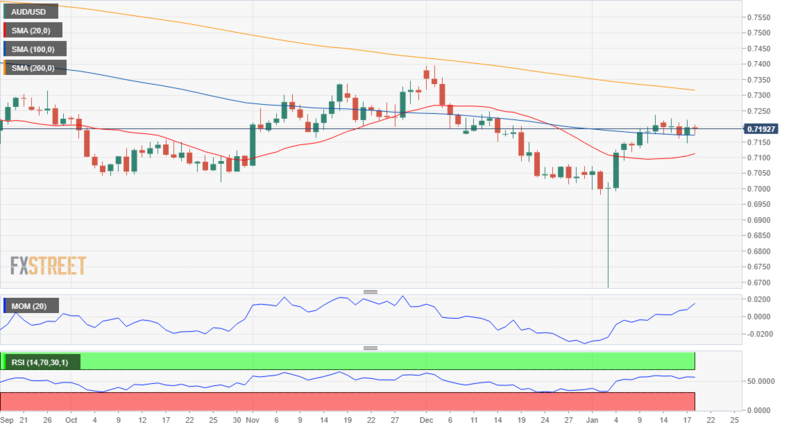 The pair traded in a well-limited range between 0.7146 and 0.7225, with bulls having lost motivation after the pair trimmed winter holidays' losses. The week was quite scarce on relevant macroeconomic data beyond Chinese trade figures released at the beginning of the week, which showed that both, imports and exports fell in December, down 7.6% and 4.4% respectively, resulting in a trade surplus of 57.06B in dollar terms. The same released showed that the US trade deficit with China grew to a new record of $323.32B in 2018, clearly signaling that US tariffs are not getting the desired effect. Indeed, trade war concerns are among the factors that prevent the Aussie from advancing, alongside with speculation that global economic growth will continue decelerating this year. The pair got modest support from equities, as Wall Street rallied for a fourth consecutive week, not enough to trigger solid gains in the commodity-linked currency, as concerns about Chinese economic growth weighed more, particularly after a report released Thursday, suggesting that the Asian economy will slow further in this 2019. Australian macroeconomic data didn't help either, as the January Westpac Consumer Confidence index fell 4.7% after a modest 0.1% advance in December, while Consumer Inflation Expectations decreased to 3.5% in the same month, down from 4.0% in December. The upcoming week will bring Australian employment figures on Thursday, although Chinese GDP, released by early Monday has chances of setting the tone for AUD/USD for the rest of the week. Chinese Q4 GDP is expected to show a 1.5% advance QoQ and a yearly gain of 6.4% Y, both figures below the final Q3 readings. The country will also release Retail Sales and Industrial Production figures. Sentiment is a major factor when coming to the AUD/USD pair direction, which means that renewed risk-aversion amid the usual concerns could hit the Aussie badly. The key is in equities' markets, as the pair won't fall as long as the positive momentum there prevails. Despite the lack of follow-through, the pair held above the 61.8% retracement of the December/January decline at 0.7155, which now draws a line in the sand as a break below it would be a discouraging sign for bulls. In the weekly chart, the pair settled above its 20 SMA which stands a few pips above the mentioned Fibonacci level, partially losing downward strength. The 100 and 200 SMA remain far above the current level, while technical indicators lack directional strength around their midlines, reflecting the absence of a certain directional strength. In the daily chart, things look a bit better for bulls, as the pair held above its 100 SMA, while the 20 SMA gains upward traction below the larger one. Furthermore, technical indicators offer upward slopes within positive ground. The 0.7250 level is quite a strong static resistance, and the bullish case will be stronger on a break above it. Next resistances come at 0.7300 and 0.7340. A break below 0.7155 exposes 0.7070, while an extension below this last will like put bears in control, which will like to test the critical 0.7000 figure. The FXStreet Forecast Poll shows that the market is expecting the Aussie to keep falling, as bears are a majority in the weekly and monthly views, with sentiment turning neutral in the longer-term. The range of possible targets, however, is well limited, with the pair hardly seen below 0.7000 this quarter. As it happens with other pairs, seems the market is discounting dollar's weakness in the 3-month view rather than Aussie strength. For this week, 50% of the polled experts bet for a downward extension, while 25% expect a neutral stance. The Overview chart shows that all moving averages are now directionless with the spread of possible targets widening as time goes by, reflecting the uncertainty related to economic growth and monetary policies all around the world.